Do animals mourn and grieve? Whether rightly or wrongly attributed, there are plenty of cases where this at least appears to be the case. 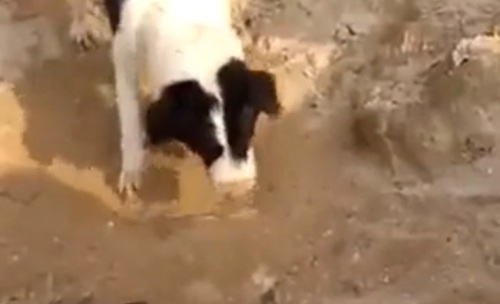 For instance, in this touching video, a dog in Iraq gently uses its nose to bury a dead puppy, in an apparent act of mourning. According to Dr. Sophia Yin, a veterinarian and applied animal behaviorist, grief is one of the basic emotions dogs do actually experience. Dogs are also able to experience fear, happiness, sadness, anger, and possessiveness. When separated for long periods from a person they have bonded with, dogs may show similar signs of mourning, maintains Dr Yin. Such dogs may show signs of becoming depressed, such as not eating as much as usual, moving more slowly, and not playing as much as usual. Given the very long relationships dogs have had with humans, going back many thousands of years, researchers at Emory University have been conducting brain scans on dogs with functional MRI to try to understand more about what dogs are thinking. However, researchers admit that determining whether dogs feel grief in this way would be very difficult, because it’s not even known what grief looks like in a human brain yet. Have you experienced any instances where you think a pet or other animal has mourned or grieved?